Hodges: “NATO is the most successful Alliance in world history” - Atlantik-Brücke e.V. Lieutenant General Hodges, your service as Commanding General of the U.S. Army Europe is about to end. When you look back to your duty in Germany, which cooperation projects between American and European armed forces have been the most successful? The most important cooperation project has been the improving interoperability for our communications systems between all the Allies. Right up there with it are our efforts to improve cross boarder military mobility, so that military formations can move quickly across Europe. Crossing international boundaries, trying to improve infrastructure. All of these things are of course intended to speed up our ability to assemble, which would give political leaders more options. 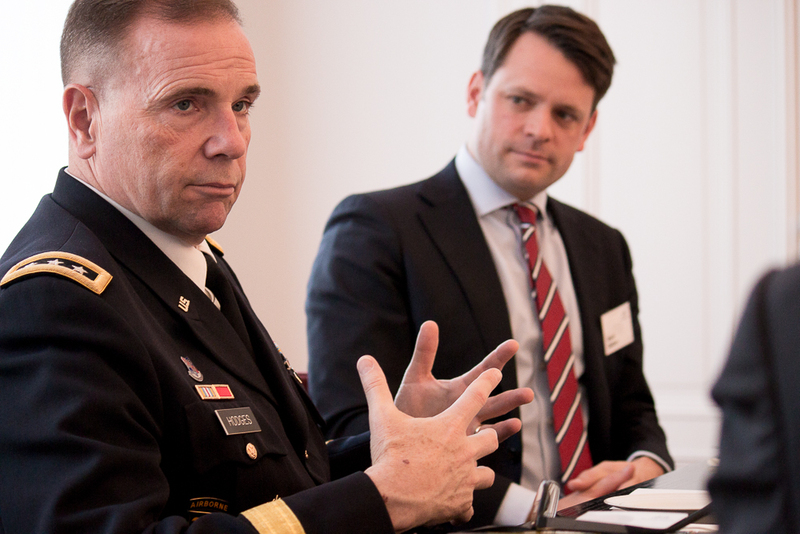 With its concept Strong Europe the U.S. Army seeks to strengthen the defense capabilities of its NATO allies in Europe. What does your first resumé on this look like? U.S. Army Europe has contributed in several ways: First, we go to everybody’s exercises and we invite people to all of our exercises. We have created and are continuously improving more sophisticated multinational, joint, and multi-echelon exercises that test logistics and interoperability. Secondly, the 7th Army Training Command with their training centers in Grafenwöhr and Hohenfels and their ability to export training capabilities to other places like Georgia, Romania, Poland and Lithuania have significantly improved training opportunities for our Allies and Partners. The quality of what they do for ranges, for example, or with the observer controller trainers has helped raise the bar for quality training for many countries in the alliance and in Europe. NATO is the most successful Alliance in the history of the world and it is successful because of its shared values and the commitment to collective security. That is an unshakable guarantee and I am very confident that the members of the Alliance are safe. When 29 nations stick together and we all continue to do our share in contributing to that collective defense that is a powerful message and powerful commitment. The crisis in Ukraine is still not solved. Would the revitalization of the NATO-Russia-Council help to improve both this situation and the strained American-Russian relationship? For example, the collaboration in fighting international terrorists like ISIS in Syria could be enhanced. As a Soldier, of course I hope that Russia one day is welcomed back into the community of responsible nations. It is a great country with a great history and great people. There are so many places where we could cooperate and we thought that this was going to be the case, up until a few years ago. But, Russia has to respect international institutions and order. And when they do that and respect the sovereignty of European nations, then we can get back to training together, and have cultural exchanges and all those kinds of things. As well as cooperating on important issues. But this is not the 18th Century, where they get to pick and choose countries to divide up. It reflects the forward leaning adaptive nature of our great Alliance. I am impressed with both of the major command changes that have been proposed. And, I hope that Germany is the country that takes the lead on this. Particularly the rear area operations command. That is a logical choice from geography as well as capability and their organizational skills. It would do an awful lot to improve our ability to receive reinforcements as well as move allied formations across Europe. I believe nations get to make their own choices. If those nations want to join the EU and they meet the criteria then they should be able to join the EU. If they want to join the Alliance and they meet the criteria and the Alliance accepts it, then they should be able to do it. So, that is what we are all about, the self-determination of sovereign nations. Everything that was promised under the Obama administration has been delivered under the Trump administration. Rotational forces, preposition equipment, enhance Forward Presence battle group and an increase by over a billion dollars of the European deterrence initiative. When the United States is serious about something, we put Soldiers on it, we put money on it and that is what is happening in Europe today. The president, the vice president, secretary of defense, secretary of state, everybody has confirmed our commitment to Europe and guaranteed our commitment to the Article 5 of the Washington treaty. It will continue to adapt, it will continue to be the most successful Alliance in the history of the world. The fact that the Alliance continuously looks at its’ structures, procedures and policies and the fact that NATO works very hard to be effective, and its’ historical success is what will guarantee that it is still here ten years from now. As the principal and most effective security framework in the world.